Before we dive into budgeting and decorating, let's start small. You can live well on less by taking care of the details. Small moments are ideas that you can do with 5 minutes of extra time. Small touches are details only you may notice, but contibute to a sense of beauty. 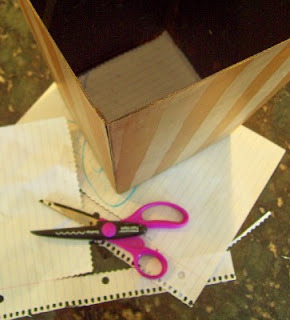 Small spending are projects that don't require a trip to Michaels for supplies. 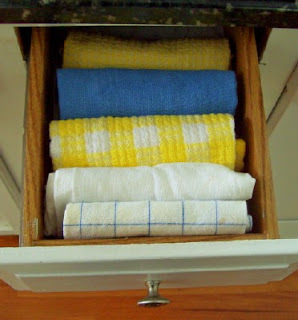 Use small moments on the telephone to fold dish cloths into pretty layers. They are just as easy to grab as paper towels. My stash of yard sale hair bows keeps growing. A small moment hunting in a closet produced an old ribbon belt and a nail for hanging. Much better! Can you make something more attractive by using something from your cupboards? 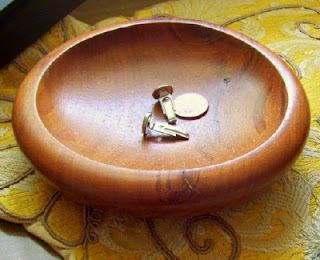 If your husband unpacks his pockets each day, give him an odd salad bowl or wood box for the contents. He may not notice, but you will. Here's another small touch of beauty. Fine hotels place paper doilies at the bottom of wastepaper baskets. If you don't have any doilies, cut a few of your own using children's old sketches and scalloped scissors. A dampened doily lets you know when to wash the container. Small spending encourages you to find solutions with what you already own. 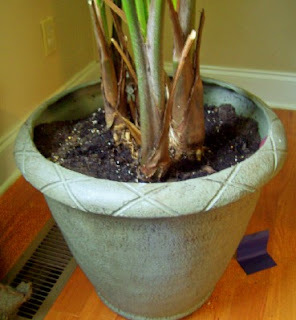 The baby loves to stir this palm's soil, but I didn't want to buy moss at a craft store. These rocks, gathered on a fishing trip, add a touch of color. Pinecones, shells, or sprigs of ivy to root would be just as unique. What small touches make your home a more gracious place to live? Those are great ideas. I love the towel drawer. I do that with all my husband's t-shirts. We do that with the towel drawer. I also have a basket of rolled washcloths for the baby's face that I have decorated with a bow. 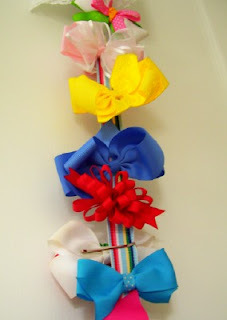 We use the same ribbon belt idea for our hair bows and I have a pretty cardboard box to store the rubber bands. I have a basket in the bathroom to store our toilet paper rolls. It really is all about the little things! Love this post! All great ideas. My personal "small touch": When someone in the family has a cold, flu or mosquito bites, or anything requiring a litter of medicine bottles on the counter for convenience, put them all in a basket (a handle will make it easy to move around the house too). Even if you don't store them there permanently, it pretties up the counter for a couple days. Thanks for getting the creative juices flowing! I wanted to fill some large clear decorative jars with "thingies" to put on a deep windowsill in the breakfast room (which is also a school room). I used big peanut-butter jars, with no labels or lids, and filled each with school-supplies: rolls of tape (out of the boxes), pens, pencils, glue, and clothespins. It looks nice, not messy, because each jar's items are all identical (all brand-new, yellow pencils or white pens with black lids). I also filled a wire basket with white rolls of adding-machine tape. And they were all supplies I already had. some of your ideas are wonderful, however the yard sale bow thing concerns me (head lice!) I know that sounds yucky, but I seriously couldn't buy used hair ornaments or hats because of that worry. Five minutes can make such an improvement. Thanks for challenging me to start using my spare moments to improve the scenery around our home. I love all your ideas and even the thought of the simple things that make my home more beautiful with what we already have! This is the first time I've commented on your blog. I really like what you write about. I take baskets from gifts (the type of baskets that once the gift is out you find yourself asking "what can I do with this besides re-gift it?") I have a two-story house, so I put diapers and wipes in one basket and keep it on the first floor (saves a trip upstairs--good when you have 2 under 2). With another basket, I put all my lotions and fragrances in it and made it "functional decoration" in the bathroom. I also received a pretty box that had a gift in it. I took the box and placed "personal" items in it and also have it in my bathroom. Wonderful ideas! I think that sometimes we get so caught up in the big housekeeping tasks that we fail to remember the simple, inexpensive touches that can make a house a home. Here by way of In a Shoe. Great ideas! This is a wonderful idea. Already thinking of "treasure rocks" that have been collected over the years from places we've visited to place in our plant pots. Now we can enjoy them and our plants at the same time - adding interest. 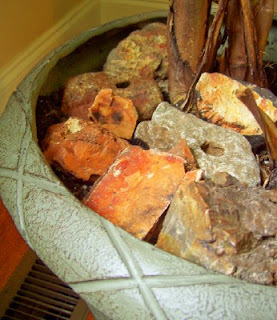 Instead of having those rocks tucked away in a paper bag or box. Love this series. 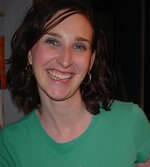 I hope to put a link up on my blog. Thank you for the thoughtfulness in which you are putting into this. I bought Elise's first bows from Amy, and I was hooked! When I saw a bag of 14 big bows for a dollar (total), I could not resist buying them! They actually rode around in the trunk of my car for a month in the Ziploc bag--so I think we're safe on the lice front. Regarding the head lice, I think if you put the bows in a bag and then put the bag in the freezer for the time, that should do the trick. I know if we buy flour or meal we put that in the freezer to kill any potential eggs or critters, I don't see why it wouldn't work for the hair bows as well.